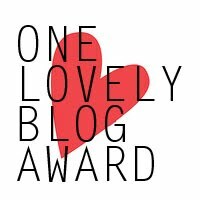 A million thanks to the lovely ladies of Coffin Kitsch and Le Professeur Gothique for presenting me with the One Lovely Blog Award. I'm truly honored to receive this award not just once, but twice. I was an internet hermit for a long time. I'd given up on forums and blogs because too many of them were negative, full of rants and arguments. When I started GIY, I hoped to give something that a few people might find helpful. I didn't expect to get anything in return. To my surprise, there is this wonderful blogger community, from which I get far more than I could ever give. I feel connected for the first time in years. Every comment I've received has been positive, and the support really means a lot to me. Feeling that people are interested in what I have to say is a great boost to my less-than-ideal self-esteem. The rules of this award are to present it to fifteen bloggers and list seven random things about yourself. I feel like a cheat, but the blogs I would choose are the same ones listed on Coffin Kitsch and/or Le Professeur Gothique. At the risk of starting some sort of infinite loop, I will refer back to their lists. 1. I have seen the movie "Clue" about 100 times. 2. My favorite food is pepperoni pizza, but I don't like cheese on anything else. 3. My heliophobia has nothing to do with being goth. When I was 18, I got a terrible sunburn, then came down with mono and a raging fever while living in an non-air conditioned dorm in summer in Georgia. It was like being on fire inside and out for days. Now when I'm in the sun, I feel like it's burning me. 4. I love Coke Zero. 5. My favorite number is 12. 6. Bane is my real name. 7. I'm extremely uncomfortable speaking to groups and will avoid it whenever possible. During my senior year of high school, I let my grades slip so that I would graduate third in my class and avoid having to give a valedictorian or salutatorian speech. Congratulations, I love your blog. You do a great job at filling an interesting niche. Where abouts in Georgia did you suffer? I went to Valdosta College and UGA. I know the horror of the GA heat! Thank you! I went to Georgia College. I'm still not sure how I survived Mays and Augusts in a dorm with no AC. Congratulations on you award, very well deserved! I think your choice of carees is great. God how many people I've met that have cluttered homes or offices. And It's very annoying to live with people who are like that :). I'm not dont have very pale skin but get burnt and get exemia very easy by the sun. It's always interesting to read your blog. It's nice to see your home building projects and I get a lot of inspiration. I'm pale but strangely enough, I tan very easily. That sunburn was a nasty surprise. Your real name is Bane? That's kind of rad. I'm one of those cluttered people. I'm bailing out as fast as I can. Indeed it is. I know it gives the impression that I'm trying to be spooky or uber cool in an evil-tinted sort of way. But it works out well because I can be the Bane of Clutter! Muahahaha!